AestheticHoliday is a serviced villa located in Thrissur, Kerala. AestheticHoliday is a serviced villa located in Thrissur, Kerala. It has all the modern amenities including swimming pool and a well equipped gym. If you are visiting Thrissur as a group for events such as marriages, family get-togethers, look no further. 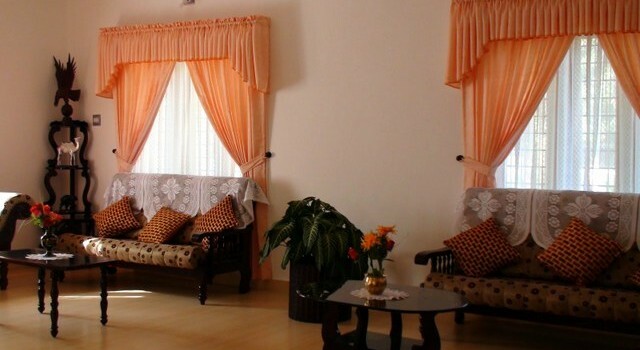 What you get is total privacy as we always rent the entire villa as a unit. AestheticHoliday has the ideal ambience for wedding photographs. We even have a beautician on call. AestheticHoliday is ideal for hosting poolside parties. AestheticHoliday is located in a 4 acre compound with nutmeg orchards and medicinal gardens. We also have several varieties of mango trees. AestheticHoliday is located at a short drive from IT parks such as Infopark, Kakkanad, Kochi. Have your next office dinner / weekend pool-side party at AestheticHoliday, stay overnight if required, unwind in the scenic beauty of Athirappilly and Vazhachal waterfalls! These picturesque waterfalls close to dense tropical green forests is a popular nearby picnic spot. Punnathoor Kottai & Guruvayoor temple. Thrissur, Kerala. Punnathoor kottai is a training centre for elephants numbering over fifty. Watching the baby elephants is an entertaining experience and one could spend a whole day there. Thrissur is also known as the Cultural Capital of Kerala because of its cultural, spiritual and religious leanings throughout history. It contains the Kerala Sangeetha Nadaka Academy, Kerala Lalithakala Akademi and Kerala Sahitya Academy. The city hosts the Thrissur Pooram festival, the most colourful and spectacular temple festival in Kerala. The festival is held at the Thekkinkadu Maidan in April or May. Thrissur has a large number of well-known temples including the Vadakkumnathan temple, Thiruvambadi Sri Krishna Temple and Paramekkavu temple, and the Guruvayur temple as well as two famous churches, the Our Lady of Lourdes Syro-Malabar Catholic Metropolitan Cathedral and the Our Lady of Dolours Syro-Malabar Catholic Basilica.